Watford Workshop, the charity based behind Furniture Village on Century Retail Park, recently teamed up with West Herts College and devised an original scheme to redesign its corporate identity. The charity, which was founded over 50 years ago, provides disabled people with Work Experience, Skills Training and Employment and helps them to achieve greater independence, become more integrated into the community and where possible move them on to mainstream employment. Watford Workshop is the only project of its kind in Hertfordshire. Faced with the task of intensifying its fundraising effort in order to meet increasing costs such as training and Living Wage and to continue to support disabled people for many years to come, Watford Workshop felt the need to be more visible in the local and business community with a refreshed and more vibrant image. A competition was launched in March of this year among first year Graphic Design students, with the challenge to come up with a new logo for Watford Workshop. This would give the students the opportunity to produce commercial work to be showcased in their portfolio and for the winning design to be used in a ‘real life’ situation and promoted on Social Media. 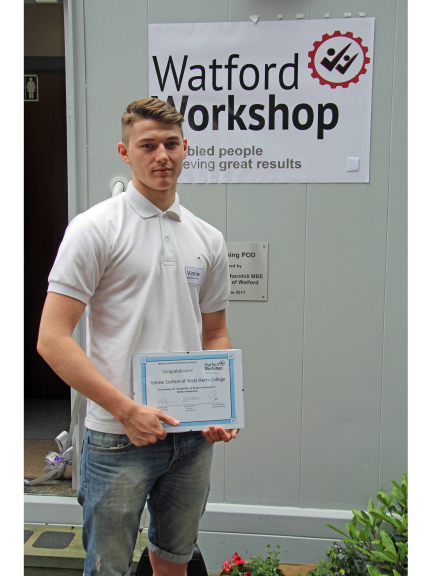 Three students, Vinnie Skilton, Jacob Montes and Sam Dietz entered and presented their work to a panel of Watford Workshop employees, disabled people, trustees and volunteers. Mindful of budget and fund utilisation, Watford Workshop has enrolled the support of local suppliers to help with the relaunch of their corporate ID and bring the new logo design to life. MailBoxes ETC in Ruislip has offered to print new business cards and literature; local firm Gopher IT is redesigning the website; and major Watford Workshop sponsor Murrill Construction will supply new pop up banners, new outdoor signage, and will revamp Watford Workshop’s best promotional tool , its van, highly visible throughout Watford and environs – all free of charge. “We are delighted to continue our support of this extremely worthwhile initiative and were overwhelmed by the professionalism and commitment shown by all concerned during our recent visit to the Learning POD opening” said Nick Mason, CEO, Murrill Construction Limited.